A Thornton “Minerva” set, probably dating from the 1920s/30s in a japanned steel ‘tropical’ case. The space under the lift out tray housed set squares, curves, etc. The electrum “Minerva” series instruments were very popular in Britain and were in production for a long time. There was a cheaper version for students called the “Techset” series, usually sold in wallet cases. Both series also appeared branded by other sellers. A J. 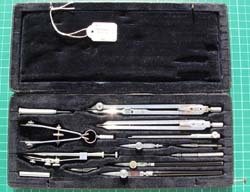 A. Reynolds & Co Ltd, Birmingham set of flat pattern instruments comprising six inch compass set, dividers, three spring bows, ruling pen, pen handle, tube of leads/needles and compass key. 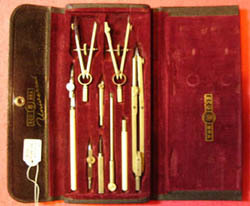 These instruments are identical to Thornton’s Minerva series and, although stamped Reynolds, were probably made by Thornton. See Who Made Them. Friedmann Bros, USA “Precision” 23a set. 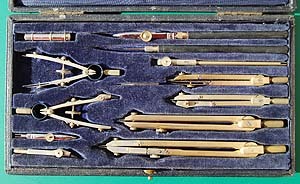 Made in Germany about 1935, this set was the largest in the Friedmann range at that time and included their patent form of “Universal” beam compass fittings which utilised other instruments, such as the spring bows. The leather wallet case has side flaps as well as top and bottom ones. The flat pattern compasses follow closely the designs originally developed by E O Richter in Germany. The instruments are nickel silver. Holtgebaum & Heinicke AG, Berlin NW7 “CHROM-PVII” branded set dating from c1940. An early example of a chromium plated brass set brought to England by a soldier at the end of World War II. 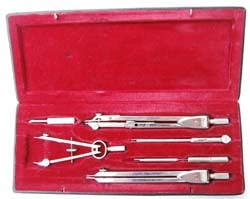 The instruments have the same, stylised windmill Ecobra trademark as the set below. Made by Bayerische Reisszeugfabrik (formerly Eichmüller & Co, now Ecobra) and retailed by Holtgebaum & Heinicke AG. Ecobra “Universal” 1674. 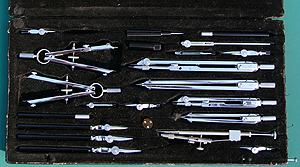 A small set of flat pattern instruments typical of those produced in Germany in the 1950s and 1960s. The instruments are nickel silver. 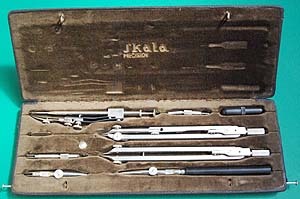 Skala Precision PV flat pattern set, made in Poland, probably in the 1950s/60s. They appear to be plated nickel silver and stainless steel. The pen handle is plastic. Lee Guinness S301 set, made in Northern Ireland about 1950. The round pattern design of this set was based on the designs of Clemens Riefler of Germany. 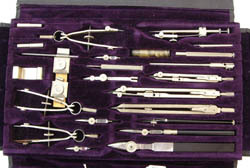 The Lee Guinness firm was set up to produce copies of Riefler instruments. They also produced flat pattern instruments in two qualities. Lee Guiness S902 set, made in Northern Ireland about 1950. 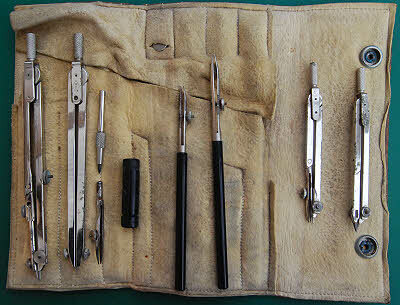 This full set contains the better of the two qualities of flat pattern instrument produced by Lee Guiness. Unusually it has two pencil spring bows. The black handled pen is a replacement. Wedoco 4682 set. These flat pattern sets of a rather unusual design were made after the second world war, some being made for the British government. 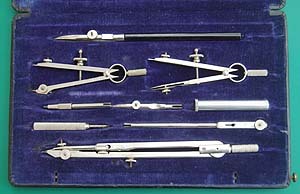 The instruments are robust but some of them are quite crudely made, especially the bow compasses which have a large screw through the head joint. Wedoco was a registered trade mark. I would very much like to know the name and address of the firm. BWC set of chrome? 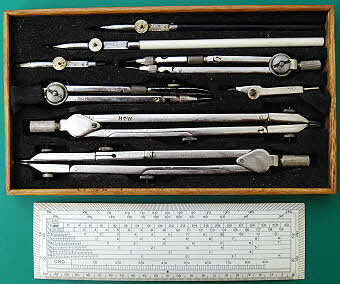 plated drawing instruments. 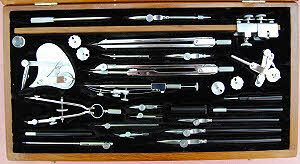 The set is comprised of a six inch hair compass and hair dividers, pen and pencil bow compasses, three spring bows, two ruling pens, a ‘protractor ivorine six inch A Mk 4’, a plastic ruler, six inch ebony parallel rule, lead box and screwdriver. Unusually the box is made of beech and lined with black cloth. It dates from the 1940s. 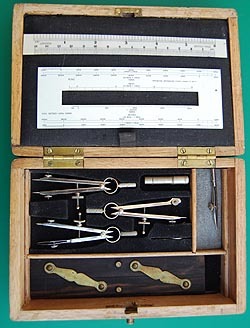 The set is of a type normally associated with UK government ownership although, apart from on the protractor, there are none of the usual markings. 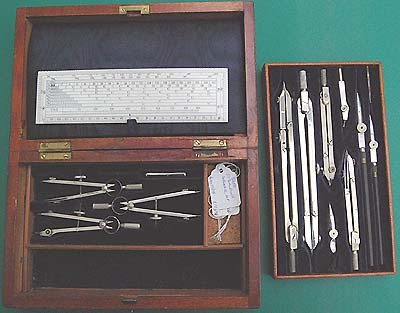 BWC were the initials of British Watch Cases of Pentonville, London who, during WWII and for a short while after made drawing instruments and Mk VII pocket compasses for the Government and sale..
A BWC London S VI set. 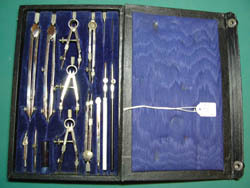 The instruments in this smaller set are the same as those in the set above except for a few detail differences. The case is covered in black leatherette and lined with blue velvet and the set is probably a little later. The plating on the pencil spring bow has come away in a couple of places revealing brass underneath. However the pen spring bow appears to be unplated electrum. Both are, I’m sure, original to the set and are indicative of the material shortages at this time. Threadwell sets from this period also have mixtures of metals. 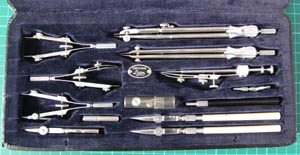 J J Threadwell set of nickel silver drawing instruments, originally supplied to the UK government. 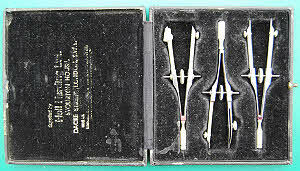 The set is comprised of a six inch compass and ordnance pattern hair dividers, pen and pencil bow compasses, three spring bows, two ruling pens, a rectangular protractor, lead box and screwdriver. It is probably missing a scale rule and parallel rule. The compass is a Threadwell replacement, the original probably was of the hairspring type. The box is mahogany, lined with blue silk and blue velvet. The protractor is housed in the space behind the lid lining. 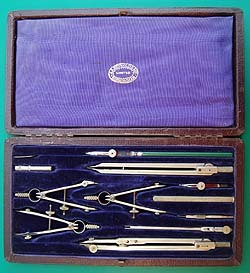 J J Threadwell set no 631 from ca.1950, showing the then new arrangement of extension bar later more commonly associated with masterbow compasses. J J Threadwell set in a red leathercloth covered case dating from the 1950s probably. 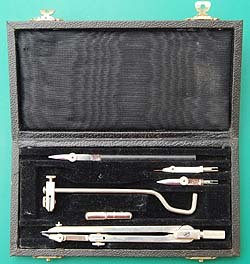 Cooke, Troughton & Simms set of nickel silver and stainless steel drawing instruments in a black, leatherette covered, blue silk & velvet lined case. Although the silk lid lining has the Cooke, Troughton & Simms name on it I am pretty certain that these instruments were actually made by J J Threadwell. 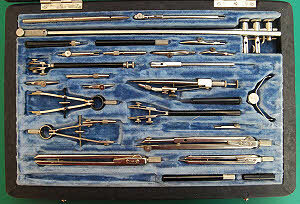 Cooke, Troughton & Simms specialised in making surveying instruments for which they were renowned. They probably date from ca. 1950. Charvos, USA, flat pattern set. It has a black leathercloth covered, blue velvet lined, wallet case. Plated nickel silver, made in the USA, probably in the 1940s. 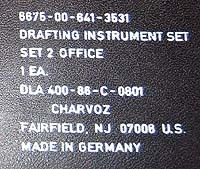 Charvoz, Fairfield, NJ, USA set made for the US military, housed in a black plastic case with a velvet finish vacuum formed plastic liner. The instruments were made in Germany except for the acrylic items. 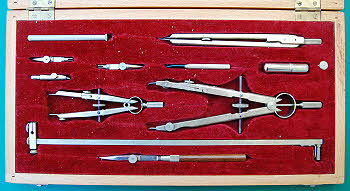 The protractor was made in Israel, the French curves in Taiwan, and the set squares in Japan. 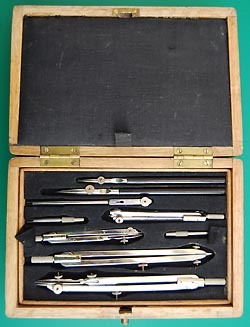 Esmond Hellerman Z8B/311 pencil compass set . The instruments are made of Nickel plated brass and were imported by Hellerman, possibly from Germany. The dividers and compass have geared heads which self centre the handle. The set is listed in the 1963/4 catalogue. Original Lotter Telesco 7E set made in Germany, probably in the 1960s. 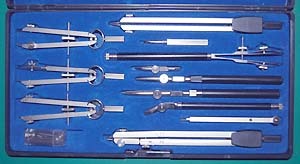 The large compass of this quality set is telescopic. 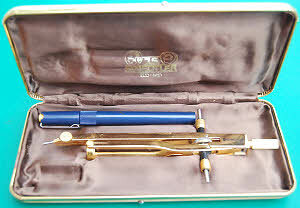 Original Lotter spring bow set, probably from the 1950s. 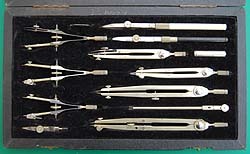 Set of drawing instruments by BOFA, China. Staedtler Mars Masterbow 551 01N drawing instrument set. About the time of World War II an entirely new concept came into being, the large spring bow, typically six inches tall. With interchangeable legs and an extension bar this evolved into the masterbow typified by this set. With the pen handle included as well, it could perform all the functions of the full sets sold previously. Rotring 532 101 Master Bow Compass. This compass was designed to work with technical pens from the Rotring range. It has an extension bar and a pencil attachment as well. 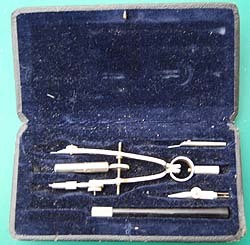 It is a quickset compass of the type made by Haff; possibly they made it for Rotring. Rotring also sold a somewhat cheaper quickset compass of the Riefler type and I also have one of these. A very unusual set by the Bayerische Reisszeugfabrik (Ecobra). It consists of (a) a wing compass with the usual fittings and also a mechanical dotted line pen insert for producing dotted line arcs and circles, and (b) a triangular divider (Dreischenkelzirkel - 1929 catalogue number 707). Towards the end of the nineteenth century the traditional pattern of instruments became supplemented with lighter patterns which could be machine made such as the flat pattern patented by E O Richter and the round system of Clemens Riefler. 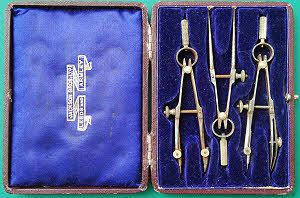 In the mid twentieth century these were in turn supplemented by master bow compasses. A set of spring bows retailed by Hall Harding. They were actually made by Lee Guiness. Norton & Gregory Diamond H180 electrum set dating from the 1930s. The compass and dividers have ball bearing heads patented in 1922 by Norton & Gregory (GB207383). This head type was also available as an option on some Thornton Minerva instruments. 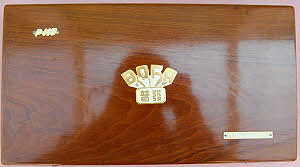 BOFA P115 set, made in China in 1961. The set had never been used. The Chinese copied this set design from a German manufacturer, possibly the Bayerische Reisszeug Fabrik (Ecobra) which catalogued this set layout in the interwar period. This brass, round pattern set is in the Riefler style although the spring bows are English pattern. The quality of the compass, divider and pen is not of the same standard as Riefler and the construction is lighter. Early 20th century. The case is English. 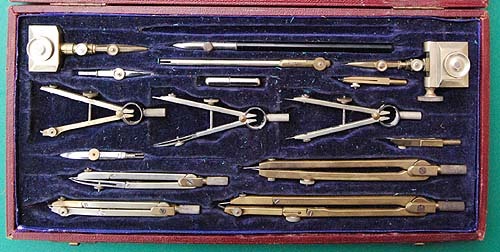 J S Staedtler 1835-1985 gold compass set. The pen is a replacement; the original would have had a gold barrel. Another BWC set, this in a leather and chamois ‘roll’. Like the other sets, the instruments are plated brass but have detail differences. Originally used by a naval draughtsman. Mid 20th century. The set is complete. 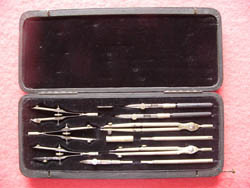 This large Russian set of drawing instruments includes a six inch compass with self centring head, matching six and four inch dividers, universal and divider spring bows, a drop bow compass, a ruling pen, plain and curved line road pens, pen handles for use with the compass inserts, a 24 inch beam compass, a pricker and a screwdriver. It is missing a four inch compass and a detail pen. The beam compass has a support. 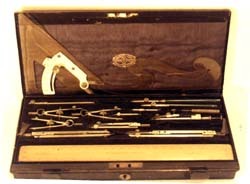 These are robust and serviceable instruments in the Richter style in a very robust, black leatherette covered, case. The principal metal appears to be electrum. Moscow maker. Probably 1950s or 1960s. A set of spring bows retailed by Jackson Bros of Armley and Leeds. Unusually for C spring bows the ink and pencil bows have clamp needle points rather than the usual nut & bolt needle points and the divider has plain points which is more typical of continental ones and is again unusual on the C spring type. 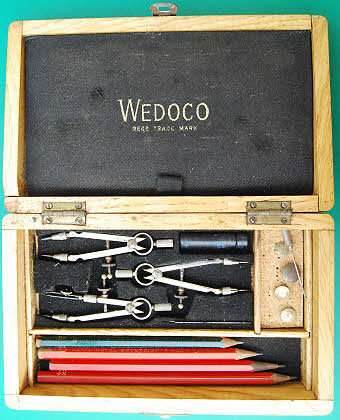 A WEDOCO set made for the British government. The instruments are basically the same as those in the civilian 4682 set above but are stamped H↑W instead of WEDOCO. 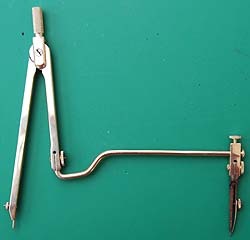 The divider also has hairspring adjustment. 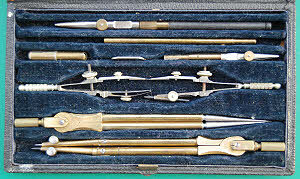 Tower 5121 drawing instrument set donated by Cathy Carr. It had belonged to her father, Ken Carr, who worked for Ford and also Shorts. The set, made in Germany and in virtually mint condition, probably dates from the 1960s. It is housed in a polished wood case. The eleven inch extension bar for the large bow compass is unusually long and enables the instrument to be used as a beam compass. The instruments are nickel silver. the pen wipe (not shown) is marked “Sears, Roebuck and Co”; were they the retailer?